Ewart, Gail. February 8th, 2019. Peacefully at hospital. Late of Twisel Lodge, Holywood. Loving daughter of Ann and the late William. Much loved sister of Heather. Service in Donaghadee Parish Church on Tuesday at 10.30 am. Funeral afterwards to Clandeboye Cemetery. Family flowers only please. 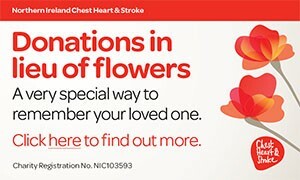 Donations may be sent if desired to Twisel Lodge Care Home c/o S Clarke & Son Funeral Directors, 64 Newtownards Road, Bangor, BT20 4DR. Will be sadly missed and lovingly remembered by her mother, sister and all the family circle. Will always be loved and remembered by Uncle Harry, Nornor, Uncle Peter, Alison, Auntie Toe, Nicola, Stephen, Emma, Auntie Margaret, Uncle Raymond, Jennifer, Alistair and families. I am sorry to tell you that Gail EWART has passed away.